Indonesia’s major land regions correspond to its largest islands or groups of islands, which fall into three main geographic regions. Several of the Greater Sunda Islands, including Java (134,045 sq km/51,755 sq mi), Madura (5,587 sq km/2,157 sq mi), Sumatra (473,605 sq km/182,860 sq mi), and Kalimantan (751,100 sq km/290,000 sq mi), form part of the Sunda Shelf, an extension of the coastal shelves of Malaysia, Thailand, Cambodia, and Vietnam. The area is characterized by shallow seas less than 250 m (820 ft) deep. 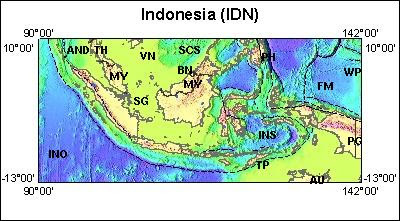 A land bridge once joined the islands of the Sunda Shelf; consequently, they still have plants and animals in common and are part of the Indo-Malayan zoogeographic region. New Guinea, which contains Indonesia’s province of Papua (421,981 sq km/162,928 sq mi), and the nearby Aru Islands are part of the Sahul Shelf that stretches north from the coast of Australia. Like the seas around islands of the Sunda Shelf, the seas of the Sahul Shelf are shallow. But, the islands of the Sahul were more closely linked to Australia than Asia; consequently, they have animals that are similar to Australian animals and are part of the Austro-Malayan zoogeographic region. In between and separating the Sunda and Sahul shelves are the islands that make up Nusa Tenggara, along with Maluku and Sulawesi (189,040 sq km/72,989 sq mi). Seas in the area reach depths of 5,000 m (16,400 ft), so that even when sea levels were lower, there was little movement between the Sunda and Sahul shelves across this area. The British naturalist Alfred Russel Wallace drew attention in the mid-19th century to the great contrasts between the Sunda and Sahul, illustrating his case with the differences between the ecologies of the islands of Bali and Lombok. As a result, the border between the Sunda and Sahul came to be known as Wallace’s Line. Although the line’s precise dimensions are now disputed, there is little dispute about the significant differences between the Sunda and Sahul. Indonesia, has about 400 volcanoes, of which about 130 are active and 70 have erupted in historical times. Most are distributed in a chain along the southern islands: from the tip of northern Sumatra and along its western coast; through Java, Bali, and the eastern islands of Lombok, Sumbawa, and Flores; and into the Banda Sea. Another group clusters around northern Sulawesi and Halmahera Island in the Moluccas Sea. The most famous volcanic eruption occurred in 1883 when Krakatau exploded and killed thousands of people on Java and Sumatra. The eruption of Tambora in 1815 was Indonesia’s most destructive, killing approximately 10,000 people in the eruption and thousands more in the resulting famine. Indonesia is also prone to earthquakes, with epicenters distributed along the same regions as volcanoes. Although many causes contribute to the geological instability of the area, the main cause is the friction between the underlying tectonic plates (see Plate Tectonics). Most of Indonesia sits on the Eurasian Plate. When the Eurasian Plate collides with the Indo-Australian Plate to the south and east or the Philippine and Caroline plates to the northeast, the second plate slides underneath the Eurasian Plate. The pressure causes geological activity on the Earth’s surface that often takes the form of earthquakes or volcanoes. Recent destructive earthquakes include a 1992 tremor that struck the island of Flores, killing 2,000, and an earthquake that struck Sumatra in 1994, killing 180.